JUST back from ten days in the magnificent North-west Highlands and I'm scratching my head to think of any other area which offers such a diversity of walks. It's the perfect pick n' pix selection; Munros, Corbetts, Grahams, loch-side trails, sandy beaches, remote bothies, something for everyone, every ability, every type of weather. We were based in a house at Big Sand on the shores of Loch Gairloch, with sunset views over Longa Island to the Black Cuillin, while the Flowerdale and Torridon peaks glowed red under the full moon. At the end of the first week, some of us decanted to a second house outside Lochinver, an old favourite reflected peacefully in its own lochan, another perfect spot to settle in and watch the sun going down. We always walk together on the first day. After that, it's every man or woman for themselves, an ever-changing combination to suit individual tastes and targets. My main focus this year was a night traverse of Beinn Eighe for the Pink Moon, so with that in mind we chose An Ruadh-mheallan for the opening walk, a little gem of a hill tucked away to the west of Beinn Alligin with extensive vistas. Some eight hours after leaving the summit, three of us headed out under the full moon, heavier packs for the heavier task ahead. It took us around ten hours, but there a bit of time spent admiring our surroundings and the constant changing light. We had planned to join the rest of the group for the walk to the hauntingly beautiful Fairy Lochs crash site, but on our return we decided it would be a few steps too far and instead had a bottle of pink wine for breakfast and then retired for a few hours' well-earned rest. 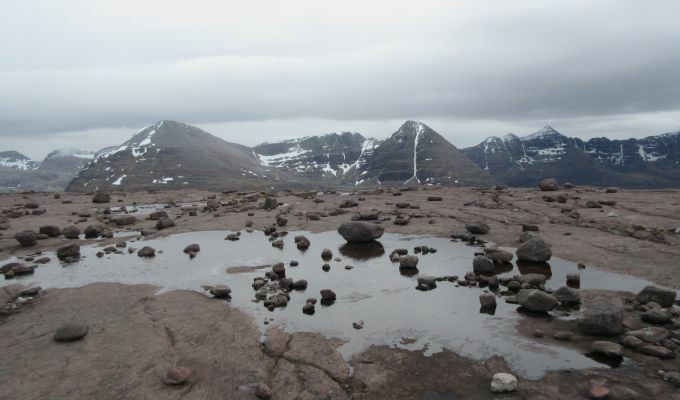 We were looking into Coire Mhic Fhearchair again the next day, this time from Beinn a' Chearcaill, a Graham which provides a superb 360 degree panorama of the Torridon and Fisherfield giants from its bizarre summit. This long, flat broken pavement brings to mind a landing strip, the litter of boulders chaotically strewn across it the aftermath of a failure to lock the cargo doors on take-off. 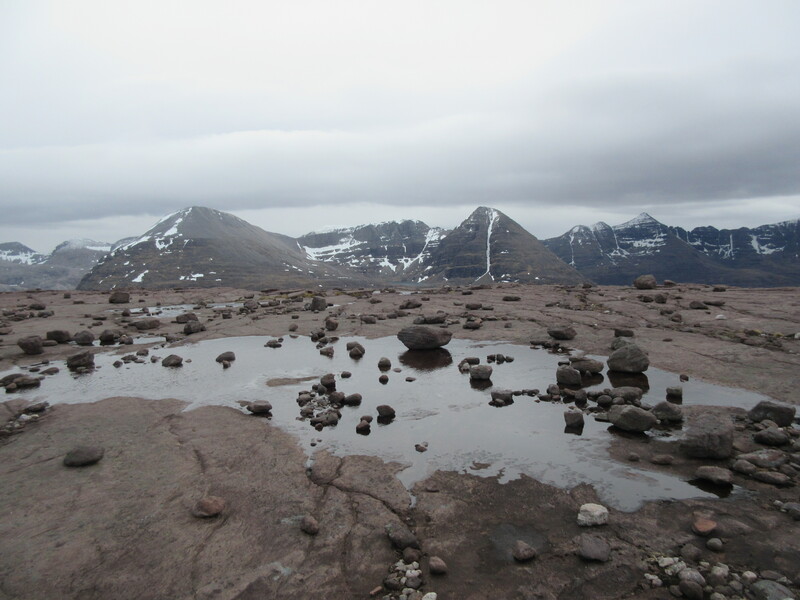 I slipped off early on my own on day four, not wishing to inflict a wet and windy bog trot on anyone else, but Beinn a' Mhuinidh turned out to be full surprises. Firstly, it didn't rain, and the walk up by the waterfall from which the hill takes its name was superb, leading to a fine cairn with a range of visibility unforeseen by the forecasters. We scheduled a rest day as the wetter and windier weather swept in, and drove over to Applecross, the Bealach na Ba shrouded in thick mist, visibility reduced to merely the next twist in the road, eerie and exciting. The hills stayed hidden again the next day so we kept low with a ten-mile walk around the shores of Loch Maree. One week down and we were on the move, but breakfast proved hard to come by. First stop at Poolewe and the cafe was shut. Open every day except Saturday. Changeover day for holiday lets we were told, so apparently no one needs food. Except, we were changing over and we were desperate for breakfast. We tried Inverewe Gardens cafe – not open until later. Hotel in Autlbea? They only served residents. Success came from following the road all the way to its end at Mellon Charles and the lovely Aroma Cafe, though it wasn't quite a breakfast menu. It seems strange that despite the popularity of the North Coast 500, so many businesses are still stuck in a bit of time warp when it comes to customer service. Either that, or I missed the memo about breakfast no longer being fashionable. 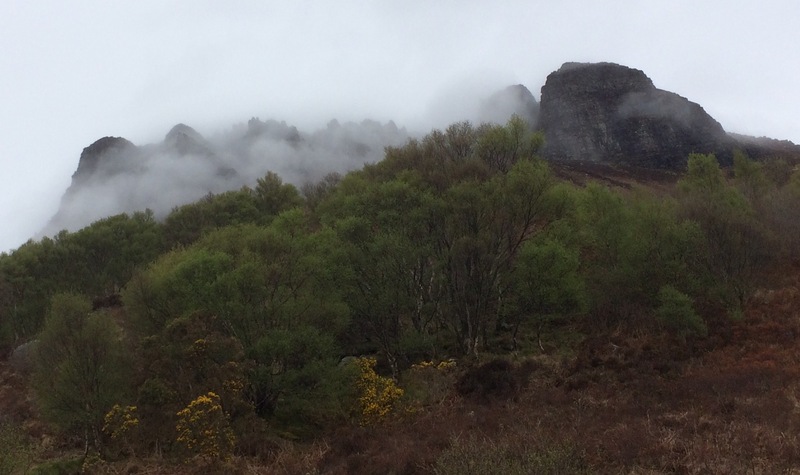 Sunday was spent slithering and squirming around in the mist on the pinnacles of Stac Pollaidh, Monday hunting for the tiniest sliver of a view on the cloud magnet of An Teallach. The evenings were a total contrast, late sunshine spilling over the loch and lighting up the water as we watched the birdlife, and, in particular, a heron stealth fishing in its favourite spot. We even had to do a bit of sheep herding, not so much One Man and his Dog as One Man and Another Man, but we made a better job of it than some of these collies and the conniving grass thieves were sent packing. My parting shot was a long, lonely walk in from Loch Stack to the northernmost Graham, Sabhal Beag, a rarely visited summit. It's no surprise to report that I never saw another soul but that's as good a reason as any to pay a visit.